Pictured left to right: Trish DiSilva, Teamsters Local 25 special events coordinator; Cathy Kanefsky, Autism Speaks vice president of field and chapter development; Larry Cancro, Red Sox VP and Autism Speaks Greater Boston Chapter president; Sean O'Brien, president of Teamsters Local 25 and Executive Board member; Greater Boston Chapter and Mark Roithmayr, president of Autism Speaks. We donate it to Autism Speaks. 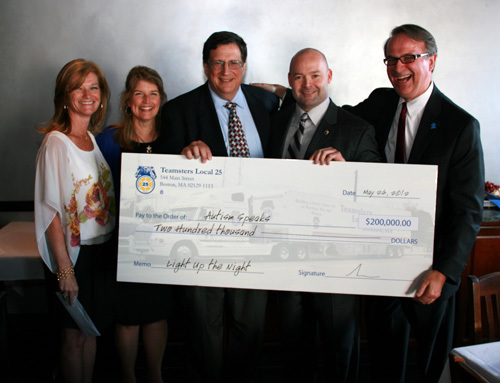 Teamsters Local 25 in Boston donated the proceeds from its annual "Light Up The Night" gala to the organization, which funds research into causes and treatment of autism spectrum disorders. We are incredibly grateful to have the support of Teamsters Local 25. Sean O'Brien has become a powerful voice and advocate for families living with autism. In addition to raising significant revenue, his leadership, passion and commitment have led to the passage of autism insurance reform legislation in Massachusetts and greater awareness in the community. This event gets better and better each year. We have a lot of fun but at the end of the night it's all about raising money for autism. We're thrilled to be able to donate $240,000 to local autism charities. Makes you proud to be a Teamster!